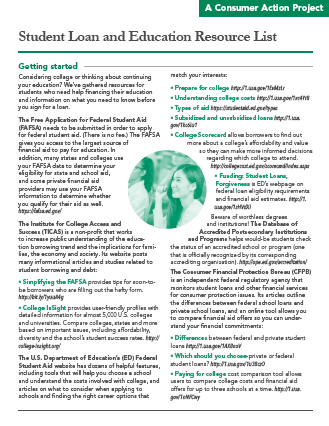 This concise, five-page guide provides resources to help beginning students figure out what their college education financing options are, what they can afford, which schools are worth the cost and how to get the student loan process started. Current and former students can benefit from the sections on loan repayment and what to do if the loan goes into default. The publication includes resources specifically for veterans. This publication is part of the Job Training Schools training module. Considering college or thinking about continuing your education? We’ve gathered resources for students who need help financing their education and information on what you need to know before you sign for a loan. The Free Application for Federal Student Aid (FAFSA) needs to be submitted in order to apply for federal student aid. (There is no fee.) The FAFSA gives you access to the largest source of financial aid to pay for education. In addition, many states and colleges use your FAFSA data to determine your eligibility for state and school aid, and some private financial aid providers may use your FAFSA information to determine whether you qualify for their aid as well. Simplifying the FAFSA provides tips for soon-to-be borrowers who are filling out the hefty form. College InSight provides user-friendly profiles with detailed information for almost 5,000 U.S. colleges and universities. Compare colleges, states and more based on important issues, including affordability, diversity and the school’s student success rates. College Scorecard allows borrowers to find out more about a college’s affordability and value so they can make more informed decisions regarding which college to attend. Funding: Student Loans, Forgiveness is ED’s webpage on federal loan eligibility requirements and financial aid estimates. Beware of worthless degrees and institutions! The Database of Accredited Postsecondary Institutions and Programs helps would-be students check the status of an accredited school or program (one that is officially recognized by its corresponding accrediting organization). Differences between federal and private student loans. Read more at the CFPB website. Which should you choose—private or federal student loans? Read more at the CFPB website. Paying for College cost comparison tool allows users to compare college costs and financial aid offers for up to three schools at a time. The New York Times’ Student Loan Calculator offers a guide to borrowing to pay for various educational institutions and provides insight on how long it takes after graduation to repay the loans. Grants.gov is the place to find and apply for federal grants. Search federal grants by keywords or more specific criteria. All discretionary grants offered by the 26 federal grant-making agencies can be found on Grants.gov. Once you apply for a grant, you will be able to track its processing status on this website. ED’s military student loan benefits guide provides information for members of the U.S. Armed Forces, including an overview of all the benefits they may qualify for and a list of helpful contacts. Department of Veterans Affairs’ GI Bill “Ask a Question” system allows servicemembers to ask questions about GI Bill eligibility and loan payments (a login will need to be created). Department of Veteran Affairs’ GI Bill Comparison Tool allows servicemembers to compare their eligibility and benefit estimates by approved school and/or program. Veterans Major Matcher. After registering an email address for free, users can conduct a more personalized search based on core strengths, interests and military experience. Best Colleges for Veterans ranks four-year undergraduate programs by key factors veterans are interested in, including GI Bill and Yellow Ribbon benefits and SOC Membership. If you have recently graduated or have begun to repay your student loans, you may have options. Federal loan borrowers do not have to accept the payment plan your lender gives you. Private loan borrowers don’t have the same flexibility, but it is important to set clear repayment guidelines with your servicer (the company that prepares your bill each month). Below are resources for federal and private loan borrowers approaching or in repayment, including tips on how to deal with loan servicers, where to get help and how to adjust monthly payments. Understanding repayment explains how borrowers repay federal loans. Repay your loans provides all the information you need to help you better manage your loan payments. Postponing your monthly payments: deferment and forbearance provides information for borrowers who are looking into temporarily putting off their monthly student loan payments. Loan servicers is ED’s guide on dealing with servicers while managing the repayment of your student loans. Loan consolidation is for those thinking about consolidating their federal student loans who want to better understand the process. Resolving disputes explains what to do when you and your loan servicer disagree about the balance or status of your loan. Self-Resolution Checklist is useful before you contact the Ombudsman (an official appointed to investigate individuals’ complaints against lenders and servicers) to help resolve your student loan issues. Student loan glossary clarifies frequently used terms like default, forbearance and servicing. Repayment estimate calculator helps borrowers see how long it will take to pay off debt by increasing or decreasing monthly payment amounts. Extra Payments. Want to pay down your debt faster by making payments greater than your monthly bill? Doing so could allow you to save thousands on accrued interest over the life of your loan. However, you will need to provide explicit instructions to your servicer so the company understands how to apply your additional payment rather than allocating the funds evenly across multiple loans. Alternative Repayment Plan and Loan Modification. If you need information on alternative repayment plans and loan modification options, this letter can be sent to your private student loan servicer to request such information. It may help you get a clear answer and avoid long hold times and transfers from one call center representative to another. Co-signer Release. If you are a co-signer or you have a co-signed student loan and are in repayment, this letter can help you obtain a “co-signer release” (if offered by your lender), which can protect both the borrower and the co-signer from a default or an acceleration clause. Debt Collection. Depending on your situation, there are many different ways to respond appropriately to debt collectors. You can consider using the following sample letters if you’re experiencing any of the common problems that can come up with debt collectors and you need help responding. The best way to pay off student loans offers tips for repayment, including targeting higher-rate debt, and an explanation of loan bundles. How to pay off private student loans offers tips for borrowers who are repaying private loans with Sallie Mae, Wells Fargo and Discover. The Institute for College Access and Success (TICAS) Top 10 Student Loan Tips for Recent Graduates in repayment offers helpful tips for borrowers beginning to repay loans. Existing income-driven repayment plans explains what you need to know about Income-Based Repayment (IBR) plans, Pay As You Earn (PAYE) repayment plans and Public Service Loan Forgiveness (PSLF) programs. How do I get them? is a guide on how to apply for IBR and PSLF programs in order to make your monthly loan payments more manageable. Tuition.io is a web-based platform that helps student loan borrowers manage multiple student loans in one place. Once you create an account, you can utilize helpful, interactive charts and graphs that make it easier to understand how long it will take to pay off your debt. Users can compare their current repayment plan to more, or less, aggressive payment options. FinAid offers comprehensive and free resources on financing education and managing debt. If you want to consolidate your private student loans, this website can help you get started. The CFPB’s guide for servicemembers with student loans includes helpful tips on repayment and information on how to lower loan interest rates. FedLoan Servicing outlines benefits for servicemembers in repayment.The site explains repayment options and eligibility requirements for the Servicemembers Civil Relief Act (SCRA). The VA GI Bill Feedback System allows servicemembers to submit complaints regarding their student loans. Defaulting on a federal and/or private student loan has serious consequences. Unlike other consumer credit users, borrowers in default on a student loan might see their tax refund taken and their wages garnished without a court order. In 1977, Congress banned federal student loans from being discharged in bankruptcy, and with the bankruptcy reform in 2005 private student loans were added to the list. However, there are options to get out of default and get the default status removed from your credit reports. Understanding default provides helpful information for borrowers who are behind in their loan payments: The article explains the consequences of being in default and ways to get out of it. ED’s Self-Resolution Checklist should be used before you contact the Ombudsman (an official appointed to investigate individuals’ complaints against lenders and servicers) to help resolve your student loan issue. The National Consumer Law Center resource sheet Should I Consolidate or Rehabilitate My Federal Student Loan? compares consolidation and rehabilitation, highlighting the pros and cons of each. Defaulting on Student Loans discusses the consequences for private and federal loans and offers tips on how to get out of default. Student Loan Rehabilitation explains how to consolidate defaulted loans and remove the defaulted student loan status. Credit.com. A New Hope for Student Loan Defaulters provides information on rehabilitating defaulted student loans. What are these programs? is a guide to the IBR basics. A guide on how to apply for IBR plans and PSLF programs helps you get your application started when you’re ready. Consumer Action’s “school loans” tag is where you can catch the latest headlines and consumer alerts regarding school loans and education financing, including policy updates and regulatory news. Brookings Institution’s report reviews all of the issues graduates with debt have to deal with, but notes that there are still very important benefits to a college education or a postgraduate degree. CFPB annual reports analyze and discuss trends in consumer complaints received by the CFPB over the last year. The report also highlights the illegal practices of the student loan servicing market, including miscalculating minimum payments, allocating payments to maximize late fees, charging illegal late fees and failing to provide accurate tax data. Federal Reserve Board of New York report on household debt and credit compares student debt to other kinds of household debt and identifies debt trends around the country. This guide is a project of Consumer Action’s Managing Money Project for financial literacy.